Though it varies with my sodium intake and such, most days there’s a 13 inch (33 cm) difference between my waist and hip circumferences. This is more than most clothing manufacturers care to design for, which makes buying pants an exercise in frustration. Some clothing lines there’s no hope for me getting along with—they’re made for apple shaped people and what fits my hips leaves a generous gap all around my waist. Some lines tend more toward pear shapes, though even those usually gap at the back of my waist. When I find a pair that almost fits, I inspect the waistband construction to see if it’ll work for my favorite no-sew solution—making vertical slits in the inside of the band and running wide elastic through to take up the slack. 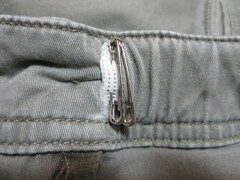 I secure the ends of the elastic with safety pins, which lie flat and don’t show from the outside of the pants (they can cause additional screening by the TSA, though). You are perhaps asking yourself why I don’t just wear a belt. I do, sometimes, but I often don’t tuck in my shirts because that’s more flattering, and having a lump of a belt buckle underneath looks weird. Recently at Bed Bath & Beyond, I came across another way to address the issue: the Hollywood Hip Hugger, an adjustable piece of elastic with clips on either end. 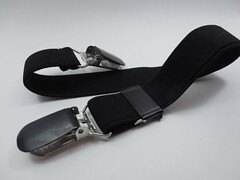 Attach a clip to a side belt loop, thread the elastic though the back belt loop, attach the other clip to the other side belt loop and voila, no more gap in the back of one’s pants. Of course this won’t work for pants without belt loops the way my elastic on the inside approach will, but most of my pants do have belt loops. It is a bit annoying that the placement of the loops is inconsistent enough from pair to pair that I have to adjust the slider on the elastic pretty much every time I use it, but that’s one time a day versus the many times a day I’d be pulling my pants up if I didn’t use it. It’s great for pants that “grow” during the day, too; I keep it in my bag and am ready when jeans that fit fine in the morning are sliding down my backside by afternoon. I am just hoping I live long enough to see the self-sizing clothes that we were promised by Back to the Future.